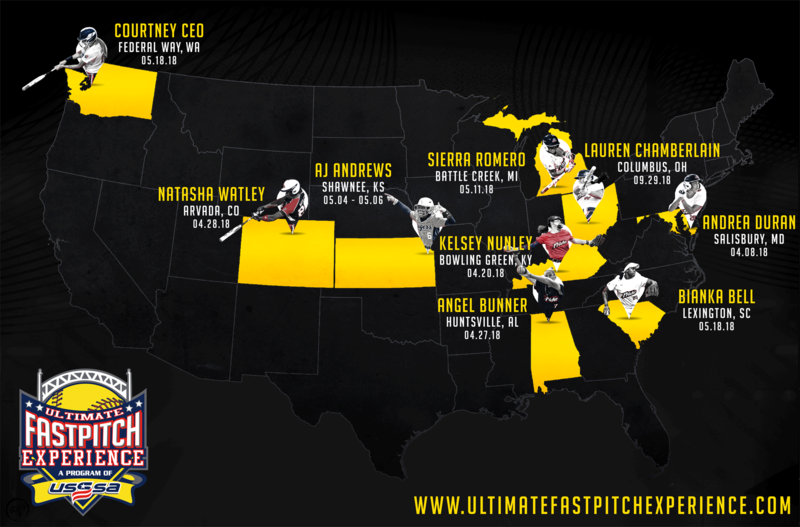 The Ultimate Fastpitch Experience is a tournament series designed to promote and showcase the individual brands of professional fastpitch players through the vehicle of amateur fastpitch tournaments. Every tournament in the UFE series is centered around the brand of a professional athlete who has had full control of the event design. Each athlete will select (1) her charity or philanthropic cause of choice, (2) an activity of choice for the top fundraising teams—one that aligns with her personality, (3) an opening night social event with teams, and (4) any other event elements that align with her brand personality. Fundraising component prior to the event. Teams will help raise money towards the athlete’s charity, foundation, or cause of choice. Saturday night event with the sponsored athlete for the top fundraising teams. This event will be selected by the professional athlete to showcase her brand personality. The mission of the Ultimate Fastpitch Experience series is to promote the individual brand of professional fastpitch players through the vehicle of amateur fastpitch tournaments that provide young athletes an opportunity to interact and engage with their role models. Provide young amateur fastpitch players an opportunity to interact and engage with their favorite players and role models. The word “Experience” was used so participating athletes have an opportunity to live the brand of their favorite players. The UFE Series currently features some of the top young professionals in our game and women who have been great ambassadors for our sport. The goal is to bring these athletes back to areas near their college campuses or hometowns to continue building the community of fans they currently have as well as expanding their brands to new audiences. This year the athletes featured are Andrea Duran, Kelsey Nunley, Angel Bunner, Natasha Watley, Sierra Romero, AJ Andrews, Courtney Ceo, Bianca Bell.